Fitting the Hope Safe-T-Bar will help protect the rear of your vehicle from reversing damage and fork lift loading as well as preserving your original bumper mouldings, light clusters, rear doors and floor panel. 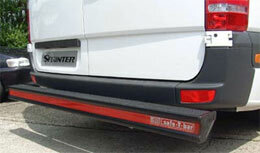 All Hope Safe-T-Bars are designed and manufactured to suit specific vehicles. Manufactured from high tensile steel main bumpers are finished with a 4 stage protective coating. Safe-T-Bars with non-slip top surface help prevent slips and trips.